Flyingroc.org: "Cyborgs had already existed..."
"...my goal was to make them hot," said William Gibson, about Neuromancer. He was in town today and read a few essays from his new book Distrust That Particular Flavor , and answered a few questions from the Microsofties in attendance. You could say I braved the snow to come to work and listen to William Gibson talk about how "the present" is so short, we have lost "the future". He was actually giving his talk in the same building as my office. One of the perks of working at Microsoft. Sorry for the blurry picture, my phone camera was not up to the task. 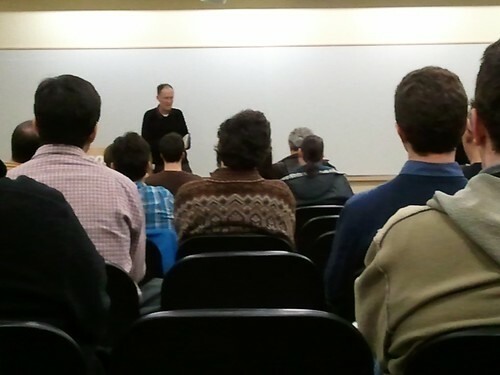 William Gibson giving a talk at Microsoft, originally uploaded by flyingroc. What do four way stops tell us about America?